Head to Gokarna Beach for a perfect peaceful beach holiday! Gokarna, a peaceful town to the North of Karnataka is known among the travel community for its temples. However, in the last decade or so, it has gained international fame for its laid-out beaches and pack of hippie travelers it sees all year round. 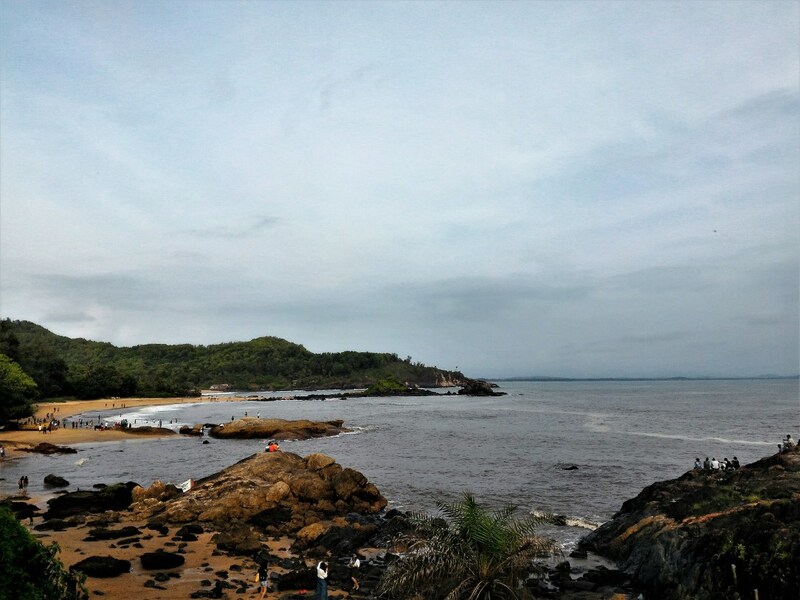 Unlike the full-stretch party hub like Goa, Gokarna is a more quiet and serene seaside. It is for no doubt, one of the best setting for a relaxed holiday in India. The Om Beach tops the list of attractions in Gokarna. It owes its name to its Om shape. It is not affected by commercialism which is why its untouched natural beauty captivates every visitor. The picturesque surroundings comprising rocky terrain and the blissful sea soothe your senses allowing you a calm and chilled out time for yourself. Try some fresh seafood from the numerous seafood joints lined at the beach. If you are a foodie and into seafood, you would fall in love with this place. Oh! And do you love water sports? There you go, head out to Om Beach and indulge yourselves in fun activities like Jet Ski, Banana Boat Ride or speed boating. The most famous temple in the temple town of Gokarna, the Mahabaleeswarar Temple is dedicated to Lord Mahabaleeswarar, an avatar of Lord Shiva [one among the trident godheads in Hinduism]. It is one of the most visited pilgrimage sites in South India. The architecture and intricate carvings of the temple reflect the Dravidian work and is a delight for tourists. Located within the Gokarna town, the Mahabaleeswarar Temple is easily accessible and must be on your list while you are exploring Gokarna. A few meters away is the Maha Ganapathy Temple dedicated to Lord Ganesha, son of Lord Shiva. It is said, one must visit Mahabaleeswarar Temple only after offering prayers to Lord Ganesha at the Maha Ganapathy Temple. Though a small temple, the ambience inside is simply divine, which raises one’s spiritual vibrations and a sense of calmness is experienced. The shady beach of Gokarna is perfect to spend some secluded time of your own. Enjoy the picture postcard view of the beach, read your favourite book and witness the sunset from this part of the world. A beach stroll at Gokarna Beach is highly recommended to enjoy the scenic beauty of Gokarna. Practising Yoga by the seaside is a great idea as well. There are many Yoga Centres where you could opt for a Yoga crash course and learn the divine technique of longevity and peace. Watersports? Yes, for sure. Surfing is the favourite activity of travellers here. The most secluded seaside in Gokarna, the Paradise Beach, just as its name suggests is a paradise for tourists. Not known to many, and accessible only by a strenuous trek or a boat ride, it is the least crowded beach which leaves you options to enjoy the spectacular landscape at your own space. Enjoy sunbathing, play with the waves or simply walk around exploring the work of Mother Nature. Yet another addition to the fantastic coastal stretch of Gokarna, the “C” shaped Kudle Beach is the favourite haunt of the foreign travellers visiting Gokarna. The palm-fringed seaside and the shimmering sea waves compliment each other well, offering a great time for the beach lovers. Let us plan your Gokarna tour. Log on to Indian Panorama and leave us a message. We will get back to you in an hour time and discuss your plans in detail.